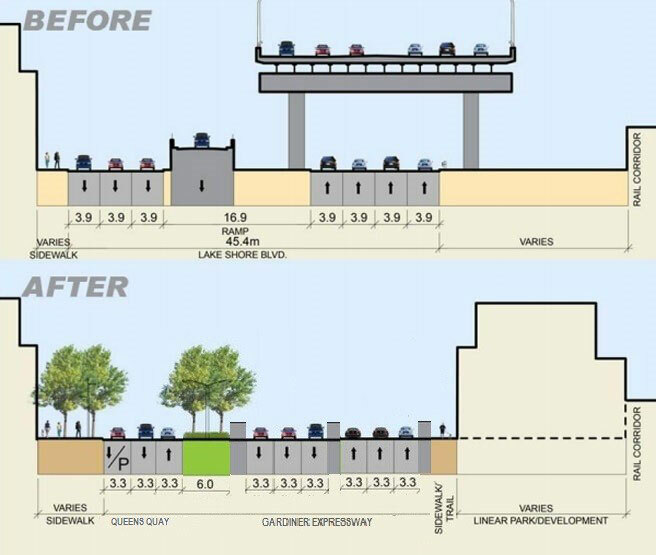 I propose rebuilding the Gardiner Expressway at ground-level between Jarvis and the DVP. This compromise would keep this commuter line open and fast-moving while reducing maintenance costs and making space for development. The Gardiner Expressway would continue to have 3 lanes in each direction and connect directly to the DVP. This lesser used portion of the Lakeshore between Jarvis and Carlaw would be replaced by extending Queens Quay to Carlaw. An underpass could be built for Parliament St. to allow traffic to flow. A ramp from the southbound DVP to eastbound Lake Shore is required, to which I have included a walkway / bike path. This ramp, and where the Gardiner eastbound crosses above the Gardiner westbound to the DVP on-ramp would be the only raised portions required. 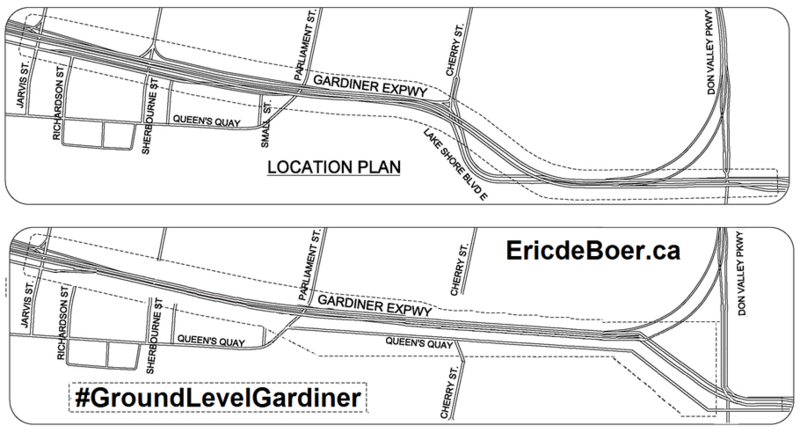 To date, two realistic options are put forward, rebuilding the elavated Gardiner and tearing it down. Rebuilding the raised highway is costly, but would allow for continued heavy use by commuter traffic. Tearing it down and replacing it with an eight lane boulevard assumes that 25% of traffic will find alternative routes and commute times would be extended by 10 minutes adding to carbon emissions. This alternative plan frees a similar amount of development space as the 8 lane boulevard option while maintaining the Gardiner Expressways volume and speed and without the cost of elevation. City Council commisioned a study at a cost of $7.6Mil, four options were put forward, only one is considered viable. Maintaining it in its current state is costly, but would allow for continued heavy use by commuter traffic. Tearing it down and replacing it with an eight lane boulevard assumes that 25% of traffic will find alternative routes and commute times would be extended by 10 minutes adding to carbon emissions. see GardinerEast.ca . I think The Gardiner must remain a highway to continue to serve existing comuters and the comuters that will come as toronto expands.